In my last post I began the dissection of the Mark Twain brand scrapbook that once belonged to Kate Sutton, daughter of James C. Sutton. 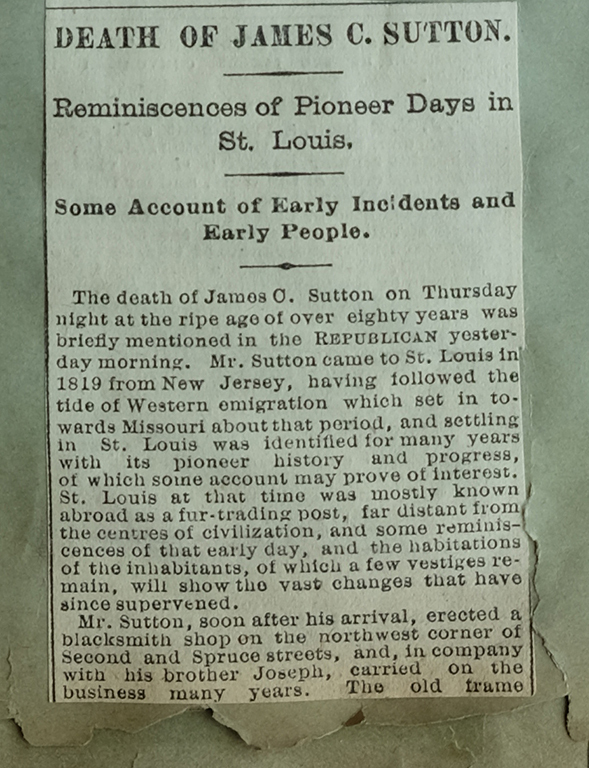 Beginning on page 3 Kate had pasted an obituary about her father who passed on July 19, 1877. Since it contained many details about the history of Maplewood, I reproduced it in its entirety. Immediately after that first obituary, Kate pasted a second one that appears to be from a different newspaper. 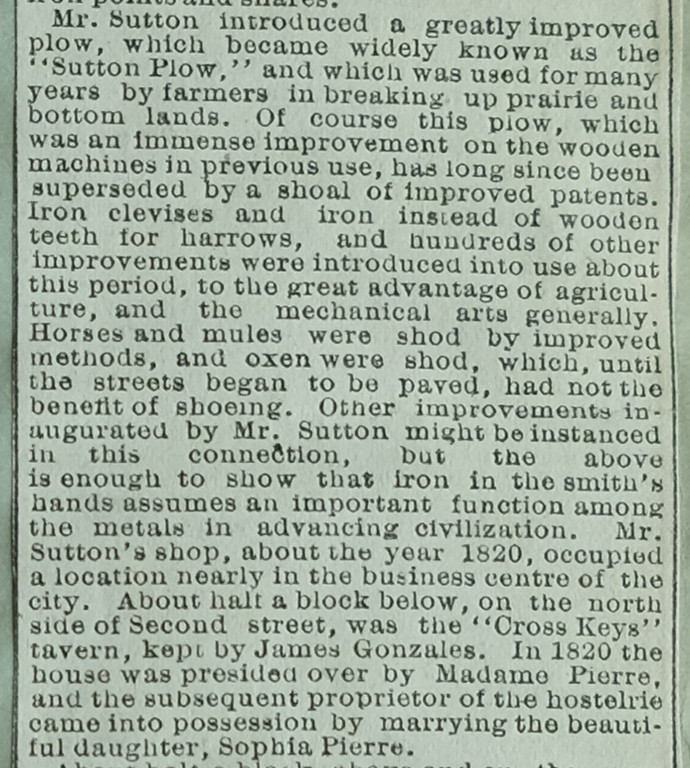 It contains many interesting details about the buildings and people near the location of Sutton’s blacksmith shop in downtown St. Louis. 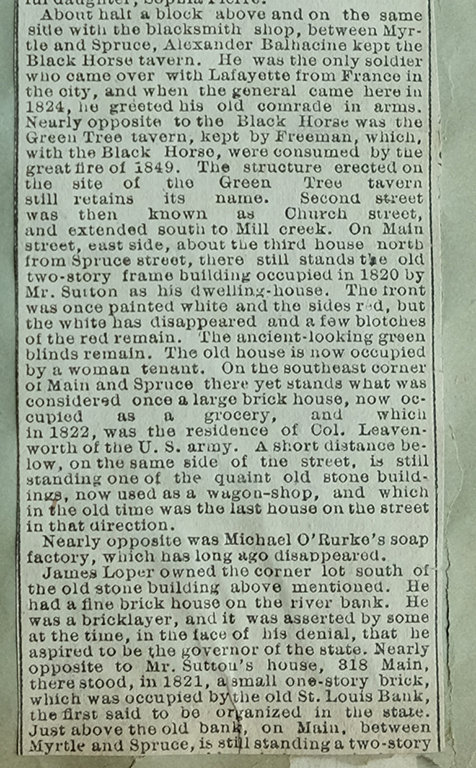 It also mentions that a few of these buildings were destroyed in the great conflagration of 1849. We know now that the boundaries of that great fire were entirely within the area that is now the grounds of the Gateway Arch. Consider that on your next visit there. Somewhere very close by was the Sutton’s shop. I didn’t hear anyone complaining so I’m assuming you all were able to read the obituary in my last post. Once again our thanks to Chrissie Hayes McConnell for sharing these bits of her family and our community history. I am fairly certain that this detail is from the 1878 survey by the Pitzman’s Company of Surveyors and Engineers. This company is now located in Maplewood (by the way) directly below the Saratoga Lanes. 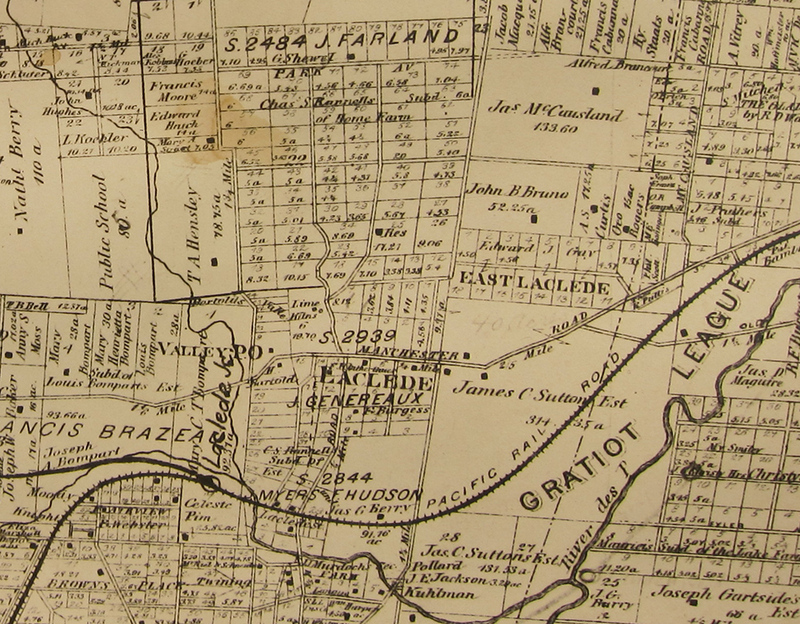 In this detail from the 1893 atlas by Johnson and Black we can see that Sutton’s children have carved up the property. Additionally A train stop called Sutton Station is now shown. 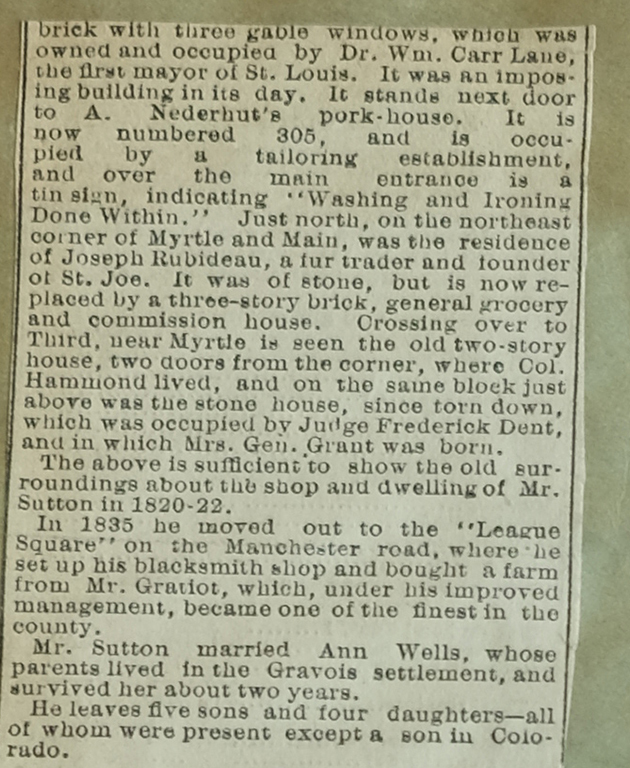 Dear Reader, I too found it interesting that the author of this obituary would write that Sutton had “moved out to the “League Square” on Manchester Road…” as if that were something that his readers would understand. There must have been other League Squares besides Gratiot’s. Didn’t the author think his readers would need more information than what he wrote? Interesting. Near the end of the newspaper piece it tells that Sutton “moved out to the ‘League Square. '” Do you, Doug, know what that name applies to? I’ve never heard it before. I’d guess it meant something or other that was more or less a league in distance from something else. Hi Tom, This is something I have looked into so I thought I would chime in. The term League is an old Spanish measure of distance. It is just under three miles. The term used here is referring to Charles Gratiot’s League Square (survey 2037). This was land granted to Gratiot from the Spanish Crown. It went from Kingshighway Blvd. in the east, to Big Bend Blvd. in the west, to Pernod Ave. in the south, and about the halfway point in forest park in the north (at about Aberdeen Pl.). A number of sources online say it only went to McCausland Ave. in the west but it doesn’t take much to determine it was most certainly Big Bend Blvd. 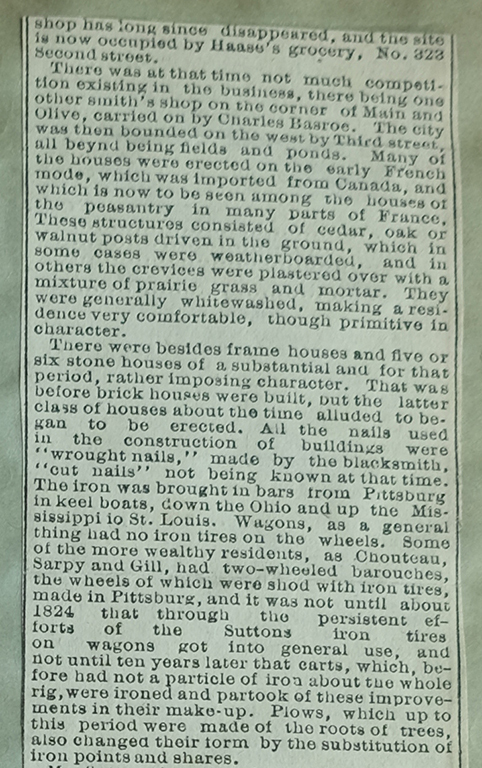 Charle’s Gratiot and his heirs are oddly under represented in St. Louis history considering the impact they made. His son Charles Gratiot, Jr. was an early West Point Graduate and would become a General in the Army Corps of Engineers. 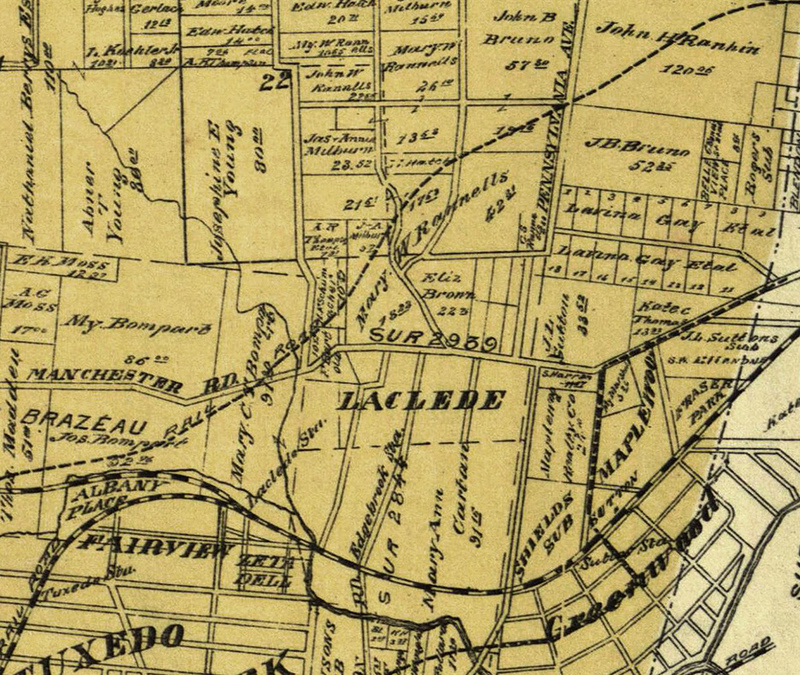 Other first generation land holders, mostly from New Madrid Spanish land grants, in Maplewood are other names it seems few have ever heard of and include: J. Farland (survey 2484) west of Big Bend Blvd. and north at Rannels Ave. to about Clayton Ave.; Joseph Genereux (survey 2939) west of Big Bend Blvd. and east of Hanley Rd. between Rannels Ave. and Flora Ave.; J.Myers and F.Hudson (survey 2844) west of Big Bend Blvd., east of Hanley Rd., North of Deer Creek to about Flora Ave.; and Therese Barois and Francis Brazeau (survey 1930) west of Hanley Road. Tom, see Dave P.’s reply. Dave has once again answered a question much better than I would have. I’m hoping we’ll hear much more from him in the future. I’m going to attach a couple of details from some early surveys that contain some of the information Dave is referring to. And Dave…Good work! Thanks, gentlemen, for the good clarification. There’s so much to learn about. Gary, You are correct. I supplied the information and photographs for that booklet. It was a collaboration between Patrick Jugo and I. Some of the kind folks at Moosylvania did the composition and layout. I believe the project originated with our very talented and unfortunately now former community development director, Rachelle L’Ecuyer. I thought then and still do that the city should have kept that in print as a handout at city hall to interested parties. Doug, Gary Tash here, I’m sure that you are aware of this, but in case not, I will send this: the 100 th anniversary of Maplewood was in part celebrated by a publication “A Stroll Through Maplewood”. This is very informative and touches on much of what you have been writing about (so more than likely you had a hand in it).